More artwork news. This time it’s for the R2 (UK) release of AvP Requiem. You can find it on Amazon.co.uk. It’s the same as the Unrated R1 artwork but with some noticeable changes. Firstly, it’s being marketed as AvP2 Requiem and secondly, it has Extended Combat Edition at the top. This confirms the UK will definitely be getting the Extended cut. The two-disc set will go on sale on May 19, 2008 with a retail price of £22.99. Thanks to DazAvP01 for the news. the cover is just ugly... silver predalien next avp will be gold i think? looks good....so this cover will be used in all european countries ?....correct me if i am wrong....this "Extended Combat Edition " will have also unrated version of AvP : R.....but avp1 extreme edition didn't have that version..am i right? 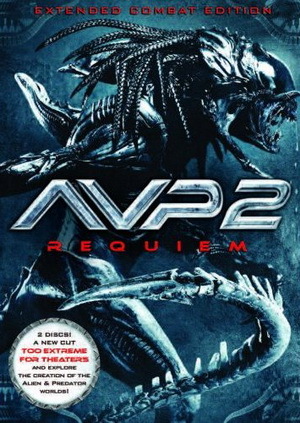 I don't like it being called AVP 2: Requiem, just AVP: Requiem, stupid Fox. The cover aint too bad but yeah i agree with the above comments that the '2' isnt needed as it wasnt called that here But im happy about the extended version! cant wait for the DVD and AVP3 Go Team Strause! Looks better then the other one, that's the one I'm going with in the U.S. it will sit nice next to my avp unrated, quadrilogy, P. 1 C E, P. 2 C E and alien saga I'm still eyeing that alienquad aniversary head!!! I can't wait for the DVD to come out in Bulgaria. the avp2 thing is cus region 2 is more than just the uk.